Coinciding with International Cat Day, LoveCrochet is pleased to announce our partnership with Battersea Dogs & Cats Home in London! 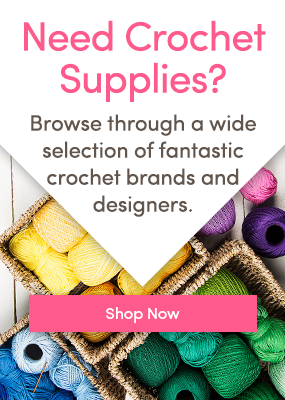 We’ve teamed up with some of the best crochet designers to bring you six amazing patterns. Five animal patterns are based on a real dog or cat that was once at Battersea, and has now been rehomed to a loving family, and another pattern is a cat-inspired blanket. The blankets are a natural match for LoveCrochet and Battersea, as every kitten and cat that leaves the cattery goes home with a donated blanket that was in their room with them. These handmade blankets offer a sense of familiarity in their new environment. The patterns are available here, and are can be purchased until the end of November. 100% of the pattern proceeds go directly to Battersea Dogs & Cats Home to help find homes for even more lovely little pets. Hazel, the charmingly one-eyed cat designed by Moji-Moji was based on a cat that came in as a stray needing major surgery after being hit by a car. Her right eye had to be removed immediately and sadly the vets realised the accident had damaged the optic nerve in her left eye too, leaving her blind. A special indoor home was found for this sweet, young cat who’s so loving and great fun to play with. Daffy, designed by Lucy Collin, is based on a cat who had a tough start to life after she was found wandering the streets of Slough at just 4 months old. She was brought into the Battersea Dogs & Cats centre late and it was clear to staff that she had been a pet due to her affectionate nature. The poor girl wasn’t in a good condition and was suffering from sore eyes and cat flu. Thankfully she received plenty of TLC from the cattery staff and the vet nurses during her stay, and a month later was ready for a new home. She was snapped up almost immediately! International Women’s Day: Patterns for Women for Women International 5 Crochet Projects to Try for World Kindness Day 5 Patterns to Celebrate International Sloth Day! Acer CAL: Video tutorials from Joanne Scrace and Kat Goldin!